More power to relying on green energy. Most of us use energy without thinking about it. We just turn on lights, switch on a laptop, or put the heating on, and rarely are we conscious of the processes at work. A bill coming in might make us stop and think about how much energy we’re using, but unless we’re really plugged in to what’s going on in the grid, I don’t think it’s something we count up as we go along. We need energy to help us function in our day-to-day lives, so there’s no doubt that we also need it to be in plentiful supply. Not all of the energy sources we use are infinite, and increasing numbers of consumers have been sparked into thinking about what other forms are available. Indeed, a recent report from the Office of the Chief Economic Adviser revealed that green energy had a record-breaking year in Scotland in 2017. The report shows that the equivalent of 70.1 per cent of gross electricity consumption came from renewable energy sources, including wind and solar power – a big jump from the 54.4 per cent recorded in 2016. It was also a record year for renewable heat energy specifically, with almost six per cent of non-electrical heat demand met by green sources – up from 4.7 per cent in 2016. Altogether, solar, biomass, hydrogen fuel cell, and wave and tidal energy sources accounted for a record 10,336MW of installed renewable electricity in Scotland in 2017. 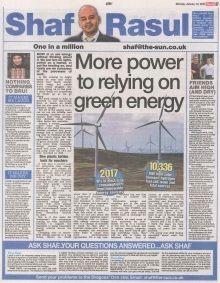 It’s clear that consumers are starting to realise the importance of embracing renewable energy and it seems that we’re getting closer to reaching the Scottish Government’s target of producing all electricity from renewable sources by 2020. But is it the same for businesses? Are companies coming up with innovative solutions to support the transition to using renewable energy sources across the board? Changing over to renewable energy sources is a big outlay, there’s no doubt about that. If you’re a large-scale business with stores or offices all over Scotland, it will cost a lot to change your approach, even if you shop around. Smaller businesses are definitely on the front foot from this point of view. But it’s not just about the physical and logistical aspect - changing over to renewable energy sources brings with it a change of mindset. It could be that after a business swaps over to solar, for example, the workforce takes steps to adopt even more environmental approaches. It’s a big commitment but one that has an infinite life cycle. Renewable energy and recycling are in the same stable. Reverse vending companies like TOMRA are now actively encouraging people to give their plastic bottles back in exchange for vouchers. I reckon we need more of those incentives for businesses. It’s up to a business to buy into the concept and to ensure they’re energy longevity, but if they know they’re getting something back, they will be able to make an informed choice. And of course, as more businesses commit to renewable energy, the companies involved in providing and disseminating the energy will grow and develop, creating the need more jobs in the industry. I’m really proud of the steps we’ve taken in Scotland to get us further along the road to the Scottish Government’s 2020 target. There’s still a lot to do but I think the leaps we have made in even the last couple of years are very positive. I’m going into 2019 feeling energized about what lies ahead. At this time of year, you’ll no doubt have heard many friends, family and colleagues swearing to stay off the booze for a dry January – you might even be one of them. And no wonder. Those that forsake the demon drink for just a month can expect to see several health benefits, including everything from a better night’s sleep and improved appearance, to easier weight loss, more energy, and better concentration and memory. With that in mind, I was taken by the initiative of two oil broker colleagues turned business partners, Andy Ramage and Ruari Fairbairns, whose mission is to ‘transform the world’s relationship with alcohol’. In two years, One Year No Beer has become the leading habit-change programme for alcohol with an 83 per cent success rate. In fact, they’ve gained 30,000 members across 90 countries. Akin to Weight Watchers for alcohol, the programme was launched after Andy and Ruari both independently took a break from the booze and discovered the massive improvements across all areas of their lives. They now preach a systematic and progressive programme rooted in behavioural science and enhanced by holistic support resources and a private community forum. Encouragingly for all of us, Andy and Ruari firmly believe that there is a growing attitudinal and cultural shift emerging from younger generations, where positive habits in respect of alcohol are being fostered and stigmas associated with non-drinkers discarded. Nevertheless, they recognise that there is still a long way to go. Indeed, alcohol still costs the Scottish economy a staggering £3.6bn a year. It’s clearly high time that Scotland seriously reassessed its relationship with alcohol – and this January might be the ideal place to start. I always admire the entrepreneurial spirit in all of its forms - particularly when it’s made in Scotland from girders. So I was impressed with shopkeeper Shugfta Ahmed’s efforts to meet supply with demand for original recipe Irn-Bru at her News 24 store in Glasgow city centre. Noting the public’s unquenchable thirst for the now increasingly rare product, Shugfta embodied the Irn-Bru spirit by sourcing 10 whole pallets and selling it on to punters at the usual price. However, with stocks dwindling amid soaring costs, she has been forced to sell individual cans at nearly £4 a pop. The really bad news? The situation is only going to get worse - the best before date on the last batch made by AG Barr is June 2019. Huge congratulations had to go to ScotRail operator Abellio last week. After all, it was able to report outstanding performance and soaring customer satisfaction levels. Unfortunately - and it’s a mighty big sting in the tail here - Abellio was only able to say that about its services in the Netherlands. The operator says that commuters travelling with Dutch company NS have a 95.5 per cent chance of getting a peak-time seat, while punctuality sits at an impressive 93.1 per cent. Meanwhile, here in Scotland, one in eight ScotRail trains are late, while the chances of getting a peak-time seat are, well, you can guess. I’ll give you a clue – it’s not 95.5 per cent. With soaring fares compounding misery, I’m ready to move to Holland at the drop of a clog.